Reprinted here in its entirety. 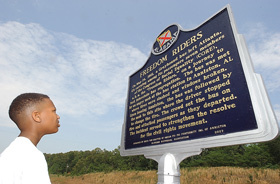 Christopher Burdell, 12, reads the Freedom Riders historical marker. Photo: Bill Wilson/The Anniston Star. It�s been 46 years since the infamous bus-burning incident near Anniston in which a violent mob attacked seven Freedom Riders crossing Alabama on a Greyhound bus to test desegregation of buses and terminals. The site where the bus burned on Mother�s Day in 1961 is hard to find now, covered by the expansion of Alabama 202. Segregation is dead and buried, but its ghost still lingers in the memories of many area residents. Saturday, a group of area residents and elected officials memorialized that past and its lessons. Members of the Theta Tau Chapter of the Omega Psi Phi Fraternity unveiled a sign near the bus-burning site. The sign recalls one chapter in the harrowing story of the Freedom Riders� journeys through Alabama. The sign was removed after the unveiling ceremony. Officials explained that it will be permanently installed once the site is transferred to the county by the state Department of Transportation. Henderson said he expects to have the sign permanently installed within three weeks. The sign is only the first step in a longer journey to a larger recognition, a park dedicated to the history of the Civil Rights Movement here and throughout the state, State Rep. Barbara Boyd told those who gathered to mark the event. Pete Conroy, director of the Jacksonville State University Environmental Policy and Information Center, serves on a steering committee working toward that goal. Committee members and the men of Theta Tau pledged to work over the next four years to make the park a reality. Conroy said the committee is negotiating with the state Department of Transportation for a few acres near the sign. The plan is to have the park completed by the 50th anniversary of the bus burning, and for it to be a place where people can reflect and learn. The planned memorial is almost in Bernard Emerson�s front yard. He witnessed the bus burning first hand in 1961. It was Mother�s Day, and most of the family was at home. Emerson said that as far as he knows, he and his wife are the only people in the neighborhood with a historical connection to the event. �We observed it from our front porch,� Emerson said. He watched the bus pull into Forsyth and Son grocery between Anniston and Bynum after its tires, slashed by the mob, went flat. The mob set the bus on fire soon after. �It�s one of those things you�ll remember all your life, I guess,� Emerson said. Henderson, who also serves on the committee working to establish the park, unveiled the memorial with fraternity member Willie Duncan. �The important thing is that we got the sign up,� he said. �It was a long time coming,� Duncan added. Dan Whisenhunt covers local politics for The Star. See story at The Anniston Star's website: www.annistonstar.com . Note: JSU faculty, staff and students may access The Anniston Star online through their affiliation with the University. Those not affiliated with JSU may have to subscribe to receive The Anniston Star online. If you already subscribe to The Anniston Star, you receive a complimentary online membership. This provides complete access to all the content and services of the site at no additional charge. Otherwise there is a $5 online monthly charge for their online service. Contact The Anniston Star for information.